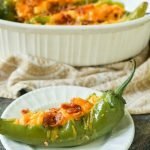 These low carb buffalo breakfast stuffed hatch chile peppers make for a delicious change from your standard eggs and bacon. A bit of spice along with cheese, chiles and bacon and you've got a low carb breakfast you can eat with your hands! Only 4.6g net carbs! Preheat oven to 350 degrees F. Heat a large pot with water and bring to a boil. Take each pepper and cut a T into it. Clean out the seeds and then place in boiling water for 8 minutes. Take out of the water add place into a large bowl with ice and water to blanch. While the peppers and boiling, beat eggs and cream together. Then add in the hot sauce and mozzarella and whisk again. Add eggs to a non stick pan and make the scrambled eggs. Mix in half of the bacon pieces and let cool. Stuff the blanched peppers with the egg mixture and then top with cheddar cheese. Bake in oven for 20 minutes. When done, sprinkle remaining bacon on top.